Don’t let her sweet smile fool you…Michele is known by her fellow athletes as “Slayer” for the way she kills workouts. Her intensity and passion for life in general carries over to the way she trains and approaches each day as an athlete, coach, woman, mother, and wife. Michele Prible entered the world of endurance training and competition as a way of coping with her father’s death several years ago, and she found it to be a healing and therapeutic process. In training, she found herself come alive in new ways and accomplish things she had never done before. Since then, she has competed in a variety of events, focusing primarily on triathlon and running. She is most energized by the sport of triathlon, where she has excelled at sprint triathlon, Olympic triathlon, Half Ironman, and Ironman distances. 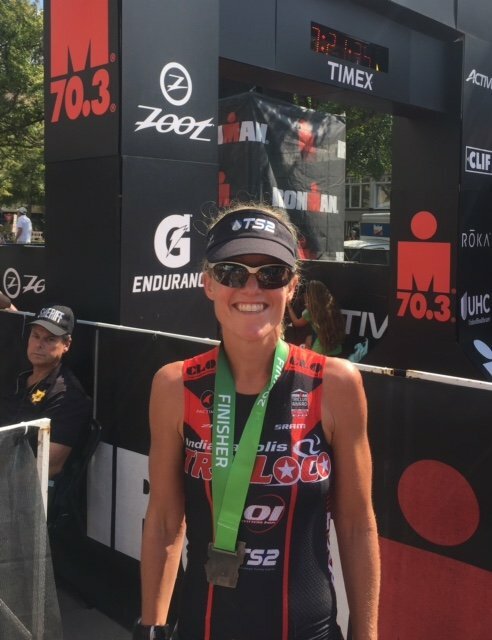 Michele is a USAT All-American athlete & Ironman Gold Level All World Athlete who consistently finishes near the top of the field when she races. A good coach combines technical expertise with a responsive and encouraging attitude. Michele is precisely that. Her coaching qualifications include: USA Triathlon Certified Coach (Level 1), United States Masters Swimming Certified Coach (Level 1 and Level 2) & USMS Adult Learn to Swim certified, and is a Road Runners Club of American Certified Coach. In addition, Michele’s background in Mental Health Counseling shapes her approach to coaching. She believes in coaching the whole person and understands well how our physical, emotional, and spiritual lives are intertwined. As a wife and working mother of three, Michele understands the unique pressures and demands that others place on women and that women place on themselves. She believes passionately that the investment we make in ourselves to live a healthy life is well worth it. She’s committed to the training process as an athlete. That’s also why she is so committed to those she coaches—whether they are beginners looking to run their first 5k or experienced athletes wanting to take their training to the next level. If you have any questions for Coach Michele, please email at michele@ts2coaching.com.